(SPRINGFIELD, IL) – While lightning is most common in the summer, it can strike year round. According to the National Weather Service, on average, 55 people are killed each year and hundreds of others are injured by lightning in the United States. It is extremely important to take lightning seriously and to stay educated on lightning safety. The Safe Electricity program urges parents and other caregivers to make sure children also understand the importance of lightning awareness and how to stay safe. Don’t be fooled by blue skies. If you hear thunder, lightning is close enough to pose an immediate threat. That is why the National Weather Service has adopted the saying: When Thunder Roars, Go Indoors! Lightning can strike up to 10 miles from the area in which it is raining, even if you don’t see clouds. This means that if you can hear thunder, you’re within striking distance. When the storm is over, wait 30 minutes after the last lightning strike you see before going back outside. Try to take shelter in a vehicle with a solid metal roof. Close the windows and avoid contact with electrical conducting paths, such as the steering wheel, ignition, gear shifter, or radio. Avoid water, high ground, or open spaces. Do not seek shelter under tall, solitary trees; canopies; small picnic or rain shelters; or in any open-frame vehicles such as jeeps, convertibles, golf carts, tractors or mowers. Do not stand near power, light or flag poles, machinery, fences, gates, metal bleachers, or even other people. If you are in a group, spread out so that you are at least twenty feet apart. If your skin tingles or your hair stands on end, lightning may be about to strike. Squat down low to the ground with your head between your knees making yourself the smallest target possible. Turn off and unplug appliances well before a storm nears – never during. Don’t expect a surge protector to save appliances from a lightning strike, unplug it as well. Stay away from electrical outlets, appliances, computers, power tools, and TV sets. Take off headsets and stop playing video games. Turn off your air conditioner to protect the compressor from a power surge and avoid a costly repair job. Avoid water and contact with piping, including sinks, baths and faucets. Don’t wash dishes, shower or bathe during a thunderstorm. Also avoid washers and dryers since they not only connect with the plumbing and electrical systems, but also contain an electrical path from the outside through the dryer vent. Do not lie on the concrete floor of a garage as it likely contains a wire mesh. Basements typically are a safe place to go during thunderstorms, but avoid concrete walls that may contain metal rebar. Don’t forget your pets. Dog houses are not lightning-safe, and dogs chained to trees can easily fall victim to a strike. 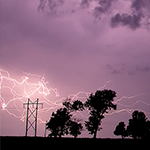 If a person is struck by lightning, call 9-1-1 and care for the victim immediately. You are not in danger of being electrocuted by the victim. More information on lightning safety can be found at the National Oceanic and Atmospheric Administration website at www.lightningsafety.noaa.gov. Safe Electricity is an electrical public awareness program supported by a coalition of hundreds of organizations—including electric utilities, educators, and others committed to promoting electrical safety. For more information visit www.SafeElectricity.org. The Energy Education Council is a 501 (c) 3 non-profit organization dedicated to promoting electrical safety and energy efficiency. Established in 1952, the Council is headquartered within the University of Illinois Extension, and serves as a forum for diverse utility and energy organizations to collaborate on the mutually vital issues of efficiency and safety. Learn more at www.EnergyEdCouncil.org.